Over the past couple months, a friend and I have been in a bit of a battle to find the best/most interesting horror films to stream. The search has been rather hit or miss. But thanks to my aggressive searching one night, this little indie film fell onto my lap. When I initially saw the poster for The Monster of Phantom Lake, I thought I had found Roger Corman’s Creature from the Haunted Sea. Upon noticing the difference, I was absolutely chuffed to see that I found an indie film set in Mukwonago, Wisconsin. I don’t know how I missed this movie the first time round (my last WWW was in 2016), but the movies gods must have been smiling down upon me. The film was made, though, in Minnesota, and directed by Christopher R. Mihm. So while this isn’t “technically” Wisconsin, I will welcome you with Midwestern arms anyway. 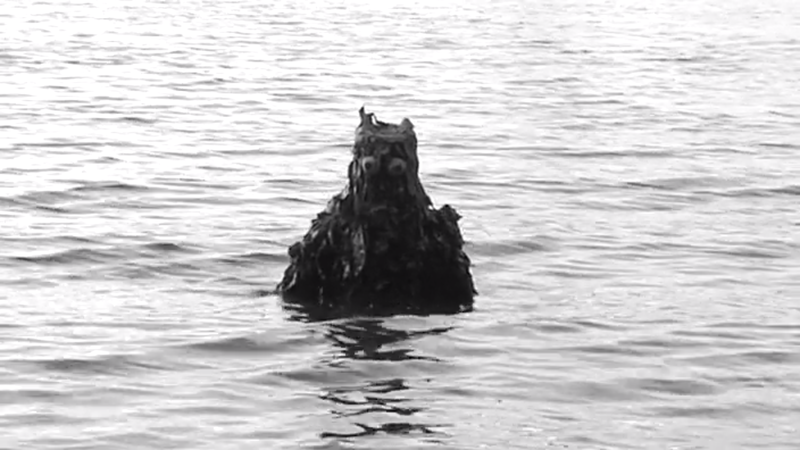 Like Corman’s Creature From the Haunted Sea, Mihm’s movie parodies 1950’s monster flicks. 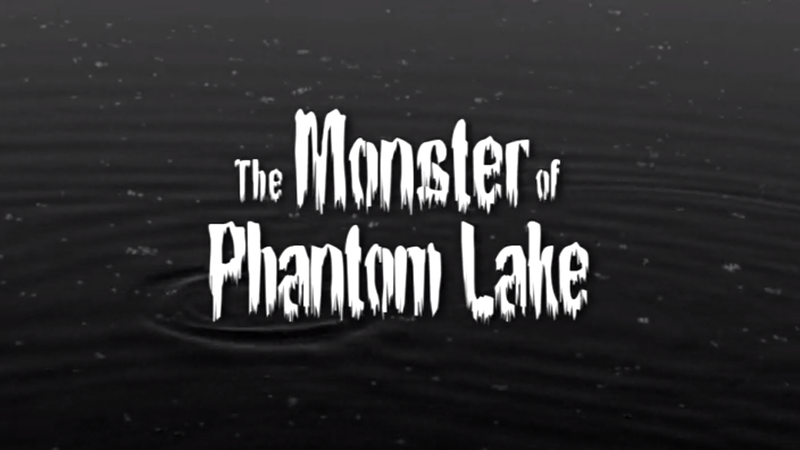 Set in the “Present Day” of the 1950s, The Monster of Phantom Lake centres around a toxic lake in a quiet Wisconsin town. A professor and his young student, Stephanie, arrive at the lake to conduct research. They also bring cases full of double entendres and sexual tension. Nearby in the woods, a group of young students are celebrating their high school graduation. The kids gather around a bonfire to tell scary stories. One boy, Jonathan, tells the tale of Michael Kaiser, an army veteran who served with his father. Jonathan tells his friends about how Michael went mad and murdered his wife, whom he thought was a Nazi spy. Jonathan then tells his friends that Michael Kaiser lives in the very woods they were camping in. And while his friends don’t believe him, they should. Michael Kaiser lurks in the woods nearby. Men from a local plant are tasked with dumping vats of atomic waste into a nearby lake. When Michael hears them, he waits in the woods and watches. As the men work, one of their hats falls into the lake. Michael jumps in after, but he falls into the lake and isn’t seen rising from the water. The scientists and the kids eventually meet up together for some science-exploration shenanigans. When the kids tell the Professor about a strange algae they find, he realises that it isn’t quite normal. It doesn’t help that the algae is in the form of a frog-man hand. After studying the algae, Stephanie discovers that the algae contains traces of “something human”. The Professor doesn’t believe her findings, and the kids go off on their separate ways. Unbeknownst to everyone, a glorious creature has emerged from the lake, ready to kill them all. That night, the kids are slowly picked off by the creature. Eventually, only Elizabeth is left. Poor Elizabeth is described by her ‘friends’ in the movie as a “square”. Which she is. She most definitely is. She goes to get help from the scientists when the monster approached them at the camp. The monster, however, goes away when it sees Elizabeth. As it leaves, it takes with it Michael Kaiser’s dog tags that were found at this abandoned camp. Despite the monster, the Professor doesn’t believe that Elizabeth’s friends are dead. The scientists eventually realise that the monster is a genetically-modified Michael Kaiser. Elizabeth, being the spitting image of Kaiser’s dead wife, was left alone. The Professor accepts Elizabeth’s story, and together they try to take down the Monster of Phantom lake. Mihm’s love of the genre is blatantly clear throughout the film. He even has a “Mihmiverse” – several films all loosely connected to each other. All of them based on various b-movie genres. You have to love the enthusiasm of someone so passionate. It’s great to look at the tropes those films through a modern lens. The Cold War suspicions and the casual sexism is abound in this film, with a tongue-in-cheek touch. The bits of nonsensical science is genius. The film’s dialogue even caught my husband’s attention. That would be the first time since watching Dead Weight nearly three years ago. Parts of The Monster of Phantom Lake do drag, but I do think that is due to the fact that it tries so hard to faithful to the genre. Thankfully, this didn’t have twenty minutes of someone running through a woods. This was thankfully shaved down for viewers like me. I’m looking forward to checking out more of the Mihmiverse in the future. It might not have been filmed in Wisconsin, but the movie had enough charm and passion for me to forgive it.